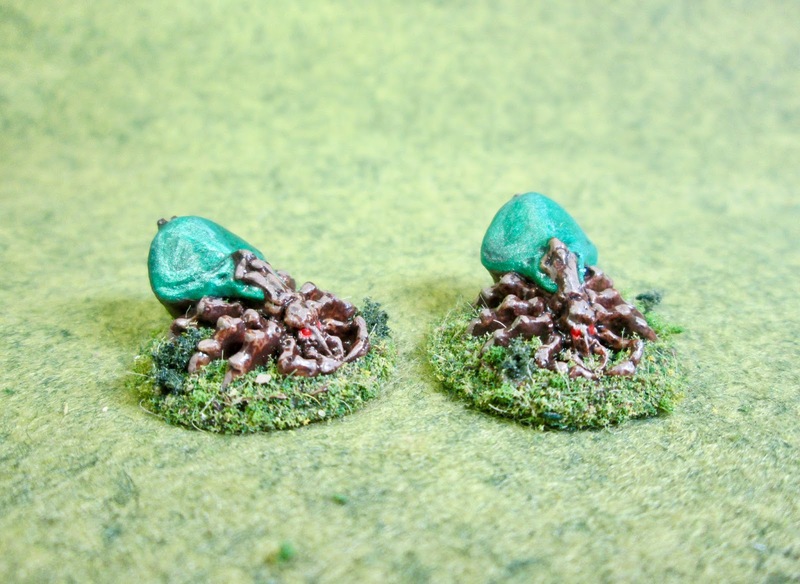 Giant Ticks: Bones 3 Figures | H.A.W.K.S. 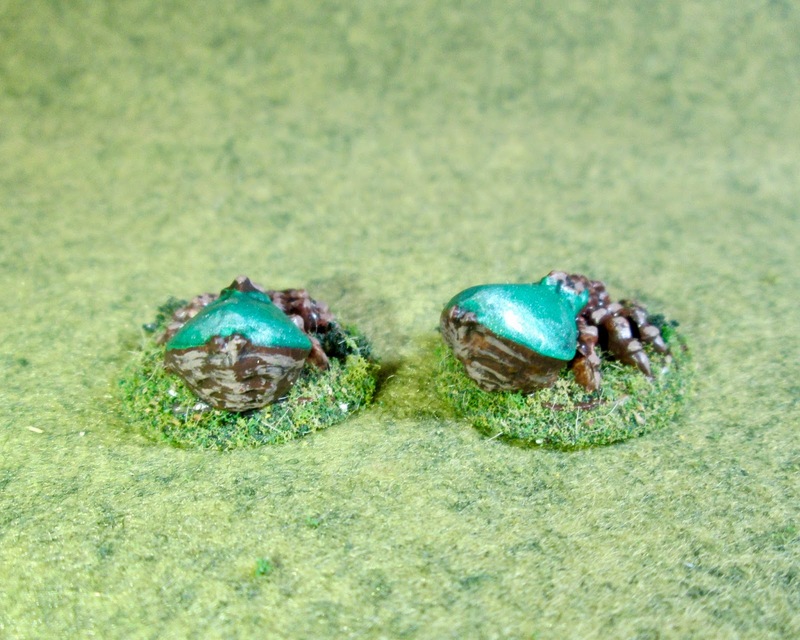 This past week I painted up a pair of the Giant Ticks from the Bones 3, 24 Bonus Figures set, as part of my continuing effort to prepare some of the monsters I’ll need for next year’s Ghost Archipelago campaign. I prepped these figures in the usual way; soaking them in a dish of water with a couple drops of dish-soap added, then giving them a light scrub with a soft toothbrush, and then rinsing and drying them. I then cut down their bases a little, and then glued the ticks to black-primed 7/8" fender washers with Aleene’s Tacky glue; and then glued the washer-mounted figures to a tongue depressor with a couple drops of the Elmer’s glue under each washer. 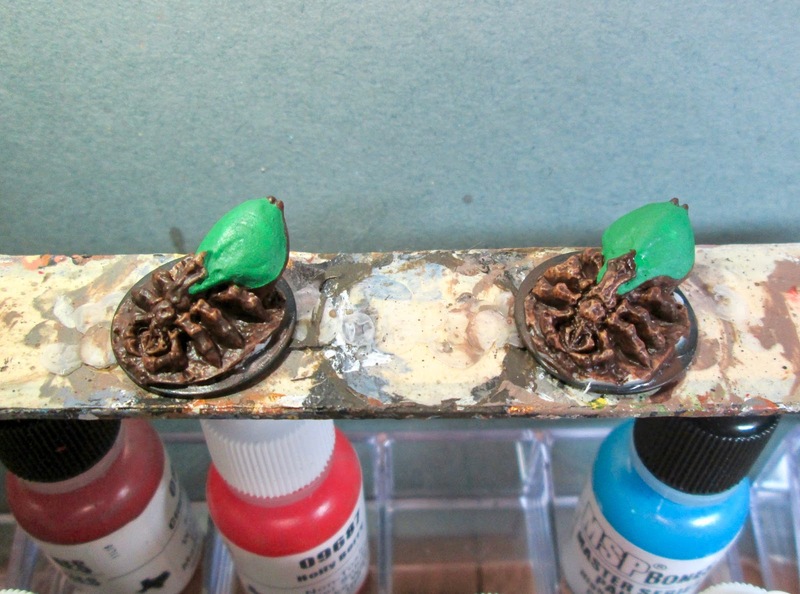 I began by painting both figures and their integral bases with Accent “Real Umber”. After that, I painted their backs with Americana “Leaf Green”. When the “Leaf Green” was dry, I over painted it with Folk Art “Metallic Emerald Green”. 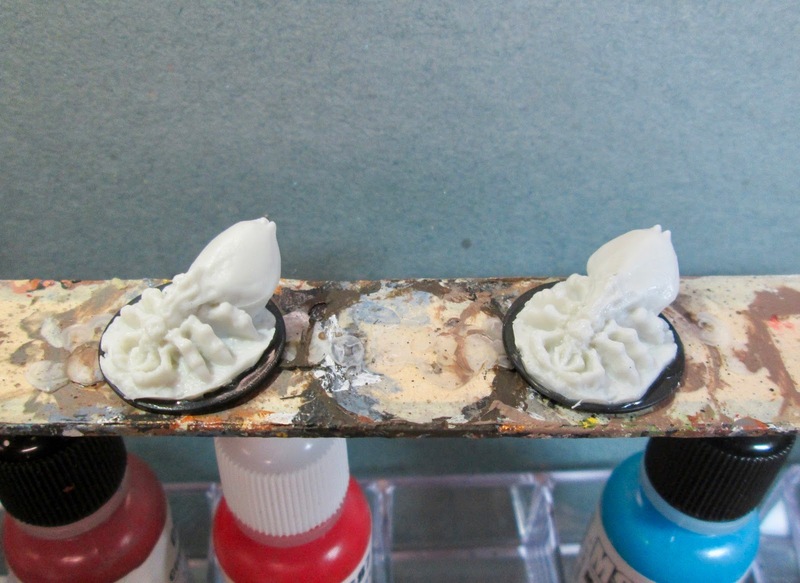 Then, when everything had a while to dry I gave both figures a complete coat of Citadel “Nuln Oil” wash". When the wash was dry, I first highlighted their main bodies with Americana “Mississippi Mud”; then after that, I highlighted their backs with some of the “Metallic Emerald Green” mixed with Ceramcoat “Metallic Silver”. Lastly, I painted in tiny eyes with some Reaper MSP “Holly Berry”. I let the figures dry overnight and the next day I gave them a coat of Americana “DuraClear Matte” varnish. Then, when the varnish was dry, I used some white glue to flock their bases. Well, they’re not anything special, and I didn’t devote a whole lot of time to them; but I think they will do very nicely as Ghost Archipelago “Jungle Ticks”.